If you want to travel to Formentera, you are in the right place. I’m not saying that just because you can buy here your Formentera Ferry tickets online: you are going to get the best price. I am sure that you don’t like to waste your time looking for information, so it’s easy: we sell tickets with the leader company and, moreover, we offer you a Promotional Code so you can get a great discount. Can you ask for anything more? We are one of the largest boat companies in Ibiza. Our boat leaves from port of Ibiza and the fast ferry service takes about 30 minutes to arrive in a direct trip to La Savina (Port of Formentera). You can also travel with your car or bike in our boat. Buy your tickets here, introducing dates you want to go this Mediterranean paradise called Formentera. As easy as choosing the day, time of yout boat and buy. After purchasing your tickets you will receive an e-mail with your e-ticket, print it and take it to the boat. Forget to queue and go in a hurry. You never know when something unexpected happens. Perhaps you arrive in Ibiza with in a delayed flight, or you may want go shopping in Ibiza streets before traveling to Formentera … Our company offers flexibility of schedules: choose an open ticket and travel at the time that most suits your plans. 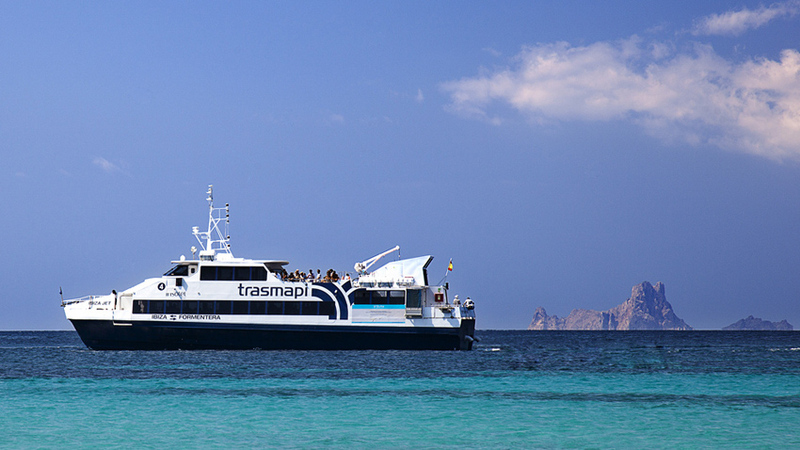 Trasmapi is the largest Formentera Fast Ferry company with decades of experience. You can go to Formentera and return to Ibiza at almost any time. Unlike many one-day excursion services with very early returns, we offer all the possibilities so you can enjoy a whole day, or as many days you like, on the island. You decide. The journey between Ibiza and Formentera takes between 30 or 35 minutes in our fast ferry. Avoid low-cost companies if you don’t want to get seasick after sailing in a slow boat. From the port of Ibiza to the port of La Savina, in Formentera. Joining the most important ports of the two islands without stops.